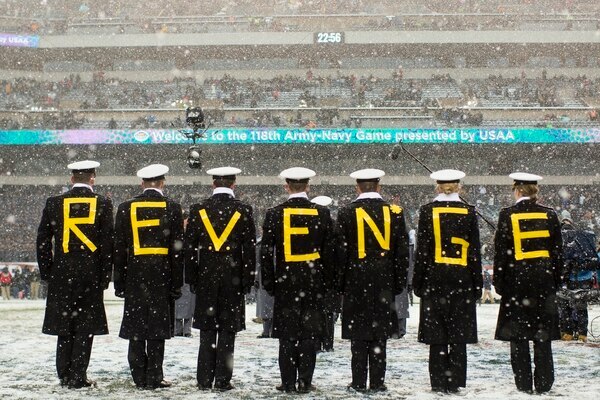 The culmination of the college football regular season is upon us, and that means one thing: the renewal of the annual Army-Navy rivalry. 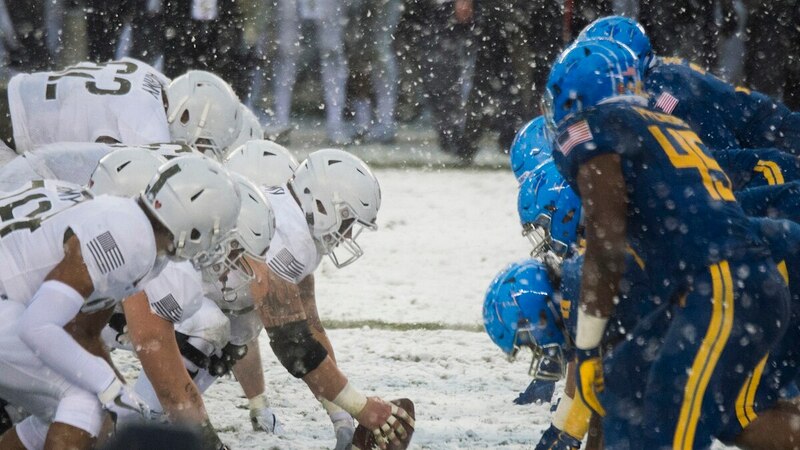 After serving as a punchline for jokes of Navy Midshipmen everywhere in the midst of a 14-year losing streak, the Army Black Knights finally beat the Mids in 2016, then followed that victory up with a 14-13 win last season on a snow-covered Lincoln Financial Field in Philadelphia, Pennsylvania. Now, with the success of the two programs moving in opposite directions, Army looks poised to take its winning streak over its service academy nemesis to three. The sleek uniform pays homage to World War I soldiers of the 1st Infantry Division. With another historic tilt just around the corner, here’s everything you need to know to prepare for another Army-Navy football clash. The two service academies will meet for the 119th time on Dec. 8. Once again, the game will be held at Lincoln Financial Field. Despite dropping its last two to Army, the Mids lead the overall series 60-51-7. 2. An Army strong season. The Black Knights (9-2) are not only aiming for their third straight win over their rivals, but have their sights set on consecutive 10-win seasons. The last time Army had back-to-back seasons of even nine wins was 1945-46. Winners of seven straight, Army has found itself in The Associated Press Top 25 college football rankings — the No. 22 team in the nation — for the first time since 1996. From 1963 to 2017, the Black Knights cracked the AP Top 25 just twice. Army’s last loss came on Sept. 22 against current No. 4 and college football playoff-bound Oklahoma (10-1), a game in which Army put a major scare into the Sooners before losing in overtime 28-21. Head coach Jeff Monken has led Army to three straight winning seasons after the program had just one winning campaign from 1997 to 2015. 3. Navy looks to right the ship. While Army’s success continues to mount, the Midshipmen (3-9) have been trending in the opposite direction. A Nov. 17 win over woeful Tulsa snapped an uncharacteristic seven-game losing skid, a stretch highlighted by a 42-0 loss to the Cincinnati Bearcats and a 35-7 drubbing at the hands of rival service academy Air Force. Unlike Army’s modern-looking ensemble, Under Armor went for a clean, classic look — and they nailed it. Since opening the 2017 season on a five-game winning streak, head coach Ken Niumatalolo and crew have lost 15 of their last 19 regular season games. 4. Army keys to the game. 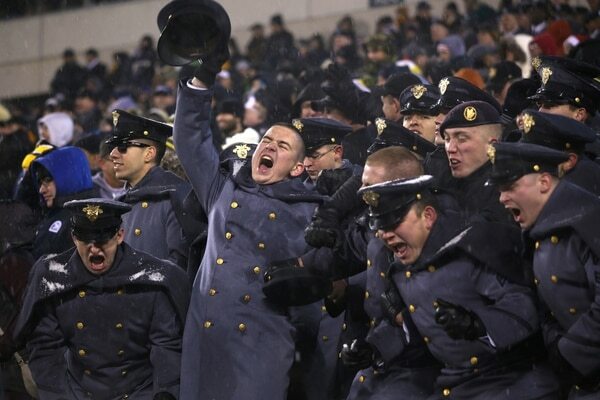 In traditional service academy fashion, neither Army nor Navy offers much for fans of high-flying, pass-heavy offenses. Junior quarterback Kelvin Hopkins, Jr. has only thrown 81 passes all season, compared to 179 rushes for 783 yards and 10 touchdowns. Hopkins is one piece of a primarily two-headed monster employed by Monken, with senior running back Darnell Woolfolk providing 823 rushing yards and 14 touchdowns on the season. Army’s rushing attack is ranked second in the nation (ahead of No. 3 Navy), piling up 303 yards per game on the ground, a key component in the Black Knights’ time of possession dominance. Army leads all 130 FBS Division I-A teams with 39:45 of possession time per game. Army’s defense, meanwhile, will have their hands full with Navy’s 3rd-ranked ground attack. To date, the Black Knights’ rushing defense has been adequate, holding opponents to 106.5 rushing yards per game while benefiting from rarely being on the field. Controlling the clock to limit Navy’s lethal ground attack will once again be a focus of Monken’s gameplan. ESPN’s Football Power Index gives Army a 77.9 percent chance at winning. 5. Navy keys to the game. Like their rivals, Navy maintains a prolific rushing attack, piling up 288.9 yards per game. As a team, the Mids have only attempted 111 passes all season, compared to 694 rushes. Junior Malcolm Perry has been and will be the featured weapon for Navy. Perry has racked up 1,035 rush yards at an impressive 6.2 yards per pop. Senior Zach Abey, meanwhile, has been limited to 2.6 yards per carry but has managed to hit pay dirt 14 times this season. On the other side of the ball, Navy’s 89th-ranked rush defense won’t force Army to deviate from their usual gameplan. The Mids are allowing opposing teams to churn out 189 rush yards per game at a whopping 5.2 yards per carry. If they don’t manage to shore up their front in a hurry, Navy could be in for a long day. Like Army’s approach, keeping the Knights’ offense off the field will be Navy’s best shot at victory. Navy also relies heavily on time of possession, averaging nearly 34 minutes per game. Keeping the offense on the field — and Army’s two-headed attack on the sidelines — will be Navy’s best chance at an improbable upset. 6. How to tune in for the fun. CBS will once again host the Dec. 8 matchup, with kick-off set for 3 p.m. The network has played host to the annual rivalry game since 1996 and is signed through 2028. Pregame festivities will be featured hours before kick-off on a variety of networks, with national shows like ESPN’s College Gameday set to join, the popular show’s fifth year in a row covering the event. 7. City of Brotherly Love. Philly will play host to the game until 2021, when the game will shift to New Jersey’s MetLife Stadium, home of the NFL’s New York Jets and Giants.